SKU: 101047 Categories: Tippmann Loader Parts, Tippmann Upgrades Brands: ACP. This kit replaces the existing hardware on your A5 marker. The kit consists of 16 pieces including: 3 body screws, 6 hex nuts, 3 grip screws, 1 ASA/Duckbill screw, 2 barrel adapter screws, and 1 cyclone feed screw. 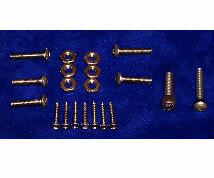 All hardware included in this kit is durable 18/8 stainless steel.